“Everything Special Needs” is a new radio show supporting parents in the special needs community. The weekly show hosted by Sue Shilling can be heard on Monday nights from 7 to 8 PM on WNJC 1360 AM. Recent guests have focused on topics such as sports leagues, assistive technology for those with autism, and training for young adults in using public transportation. “Some parents find it difficult to get out to support group meetings because of the demands of caring for a special needs child. This radio show will bring the meeting to them,” says Sue Shilling. Each week there is an opportunity to call in and brag about your child’s most recent accomplishment (no matter how small) and win a specially designed T-shirt. “Ask the Lawyer” is weekly spotlight by special education attorney, Lisa Krizman. Listeners may call in or email their questions. I think this is a such a great idea that I am a sponsor of the show. 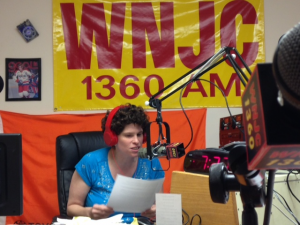 “Everything Special Needs” can be heard at 1360 on the AM dial or online at www.wnjcradio.com. You may email your questions or comments to everythingspecialneeds@yahoo.com.